The 1st part of this blog is an amalgamation of two articles. Do you agree with the claims? See the addendum for my opinion concerning these responses. 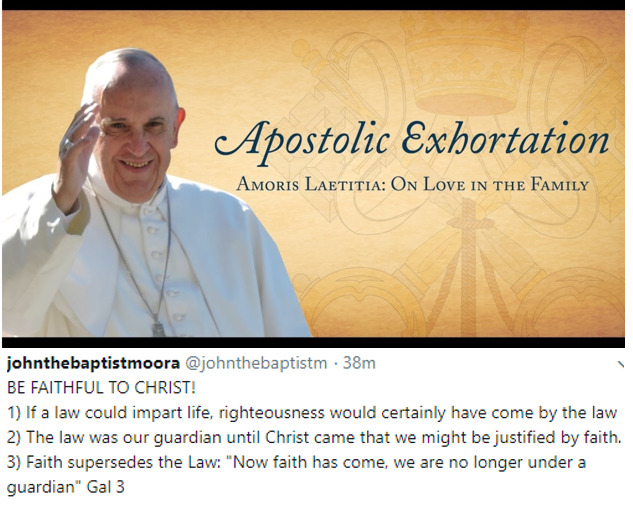 Rather, they claim the apostolic exhortation specifies its field of application and restores the role of moral discernment “on a case by case basis.” Thus, Amoris Laetitia does not lessen the universality of the norms recalled by John Paul II. Thomasset and Garrigues note that John Paul II’s 1993 encyclical Veritatis Splendor sought to address the risks of relativizing morality in the context of the subjectivism inherited from the 1960s and 1970s. Hence, the encyclical insisted on the universality of norms against a temptation to “situational morality” that threatened to give priority to intention and circumstances. In Amoris Laetitia, Pope Francis is now targeting a different aspect of the current context of modern life, namely the tremendous diversity of family situations and the real life of families in all its complexity. Therefore, a correct interpretation of Amoris Laetitia presupposes that the text need to be considered in its organic relationship to Veritatis Splendour. Here, Garrigues argues that a “rigorist” current in the Church, which was involved in the drafting of Veritatis Splendor, has given a “reductionist” reading to the document and arrogated to itself the right to interpret it. Now, Pope Francis, who is neither “laxist” nor “rigorist,” “wants to move the church away from a certain undue interpretation of Veritatis Splendour but not away from its truths.” Hence, Amoris Laetitia sets out the role of conscience, discernment and the virtue of prudence which is more demanding than the mere application of universal principles of morality to particular cases based on an “all or nothing” morality,” Garrigues warns. This is echoed by Cardinal Schönborn, who says John Paul II "showed one side of reality, so to speak, but did not look at the other". Francis added the "second half" with "Amoris Laetitia", explained the cardinal. The Pope rejects both dogmatic rigorism and laxism: he pleads for the "difficult way of differentiation", which is very "much more laborious and demanding" than a lax attitude. I ask myself whether men and women can decide for themselves what is good or evil, or do we need some training wheels to guide us i.e., the rigour of objective precepts of God’s Law? Jesus assured us that the law has a purpose, saying “till heaven and earth pass away, one jot or one tittle will by no means pass from the law till all is fulfilled” (Matthew 5:18). Again, we have this affirmation in Veritatis Splendour, “Jesus himself reaffirms that these prohibitions allow no exceptions: "If you wish to enter into life, keep the commandments... You shall not murder, You shall not commit adultery, You shall not steal, You shall not bear false witness (Mt 19:17-18)” (52). St Paul speaks of the purpose of the Law in Galatians, chapter three. First, the Law does not impart life and doesn’t guarantee righteousness; second, the law is a guardian until Christ came that we might be justified by faith; third, faith supersedes the Law as "faith has come, [so now] we are no longer under a guardian" (Galatians 3:25). Notice that arguments over laxism/rigorism, particularity/universality, situation based ethics/deontology, subjectivity/objective norms etc. that seek to define moral living, omit the concept of faith. However, Scripture attests that the upright person will live by their faithfulness (Habakkuk 1:4) to God, through fidelity to Christ (Romans 14:23). Regarding adultery – as Jesus affirmed the commandments, every Christian knows adultery is an act of infidelity to God's covenant, now the New Testament. It isn’t a case of an “all or nothing morality,” rather of whether one is faithful to Christ or not. In the “role of conscience, discernment and the virtue of prudence,” faithfulness must play a major role. Nobody is no one is deemed to be ignorant of the principles of the moral law” (Catechism, 1860), so everybody knows that adultery is an act of infidelity. Every Christian is familiar with Gods commandments, hence every individual Christian conscience can discern this. FIDELITY TO JESUS CHRIST IS MISSING IN THE CONVERSATION ABOUT AMORIS LAETITIA AND MORAL LIVING.